After visiting L'échappée Spa (which stocks the amazing Absolution brand of organic, made-in-Paris skin car products) early one Friday morning I was happy to stumble upon the bustling Marché Popincourt. The market takes up a series of blocks along Boulevard Richard Lenoir in the 11th arrondisement and, in keeping with the general atmosphere of this animated neighborhood, proved to be livliest marché I've visited in quite some time. The friendly atmoshpere of the market on this particularly sunny morning pulled me in and inspired me to stroll the busy aisles several times. 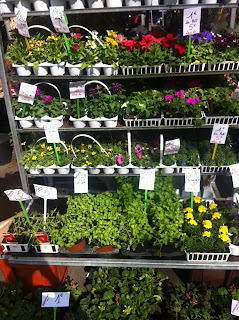 As is my habit, I was in search of local and organic vendors. A scarcity of such stands in part explains the time I spent scouring the market. I dedicated a good deal of time ooking closely at every vendor's wares, trying to find products that were grown in France or of the organic ilk. Having said that, I also extended my stay because of the warm and welcoming vibe of the market, which brought back to mind my earliest feelings of affection for shopping at Paris' open-air markets, with their intoxicated cries of vendors, mixed with the banter and small talk which is all but extinct at industrial food outlets. There was not a stand that I stopped by where I didn't overhear shoppers and catching up or chatting with vendors while waiting in line and making purchases. Another thing I appreciated about Marché Popincourt was the wide selection of flowers and other plants, whose presence coincided with the onset of my Springtime planting fever. I (admittedly prematurely) picked up a basil plant that I eagerly added to my my herb garden, despite the looming threat of cold weather forecasted for Paris. I stopped myself at the basil purchase, but promised that I'd be back to pick up a few floral additions to plant in my plot at the Jardins du Ruisseau. 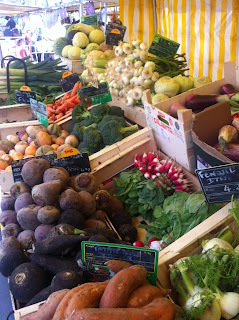 There is one organic veggie stand at Marché Popincourt, along with a scattered selection of French-origin goods such as honey and other conserved products as well as the seasonal vegetables we are so familiar with by now including beets, carrots, and an increasing selection of radishes and other undergroung légumes. If you're headed to the market early, skip your morning dose of café and head straight to the whole bean coffee seller as soon as you arrive at the market. 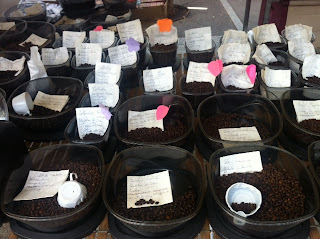 The scent alone of the rows of bags of coffee beans will wake you up, and a to-go cup of the freshly ground coffee will give you the kick you need to hit the market and get to know its jovial vendors!